Just outside of the busiest train station in the world sits Sushi Tokyo Ten. Simply entering the restaurant is a sensory experience, as a single step over the curtained threshold removes a diner from the chaos of Shinjuku Station and offers a calm and quiet, warmly lit enclave. Sushi Tokyo Ten is a culinary adventure, perhaps especially for folks who think they know sushi. The reigning principle here is omakase, which translates as “I will leave it to you.” Over the course of two hours, skilled chefs prepare 20 different small plates for each dinner guest. Each plate is prettier than the last! At the end of the experience, diners leave sated and relaxed. If you find yourself in Tokyo, I recommend spending an evening at Sushi Tokyo Ten. King Crab Rolls just might be my very favorite special occasion food. 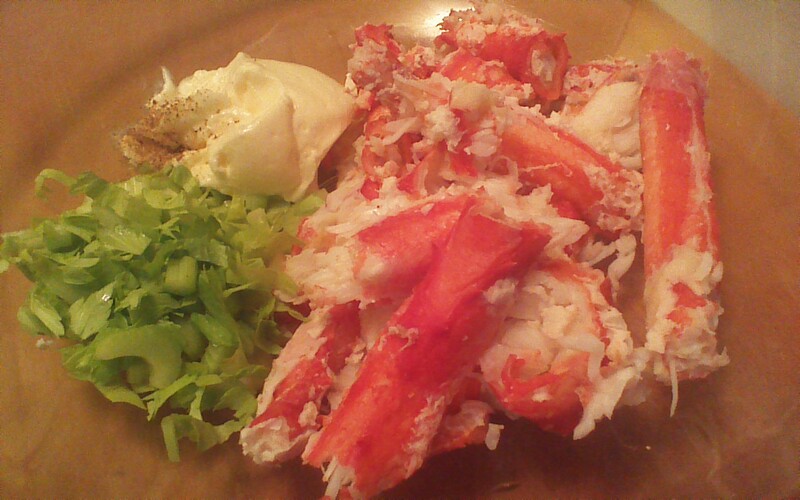 While King Crab is expensive, it is spectacularly delicious. Alaskan King Crab is a wild caught (never farmed) product, and is sustainably harvested. I feel much better about splurging on a pricey ingredient if I know my purchase is not harming the environment. Everything about this recipe, from the decadent seafood to the homemade rolls toasted with real butter, shouts “Special Day!” Whatever you happen to be celebrating, King Crab Rolls will make your mealtime grand! 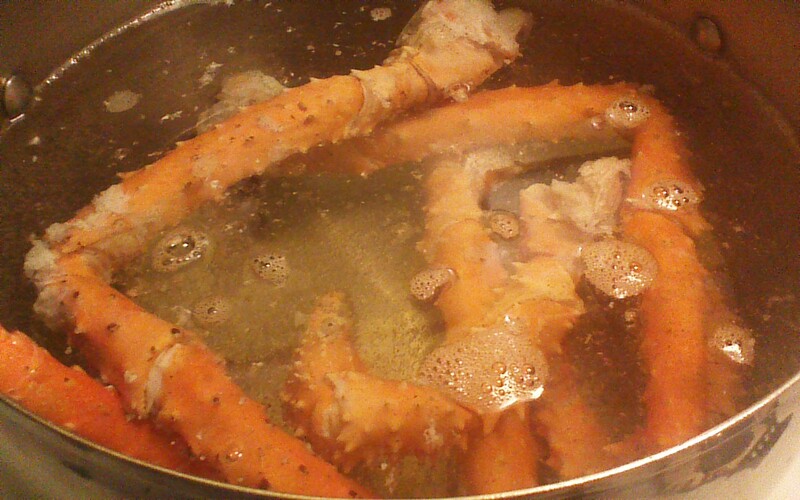 Step 1) Drop crab legs into a large pot of boiling water seasoned with 1/2 teaspoon of seafood seasoning blend. Leave crab legs in boiling water for 3 minutes if they were fresh, or 10 minutes if they were frozen (typical). Step 2) Drain crab legs and crack with a hand held nutcracker or clean pliers. Extract meat using a small fork (a fondue fork works well, if you have one). King Crab legs are spiny – hold them with a potholder to avoid hurting yourself! Be patient with this step. It may take 30 minutes or so to extract all of the meat. Your effort will be worthwhile! 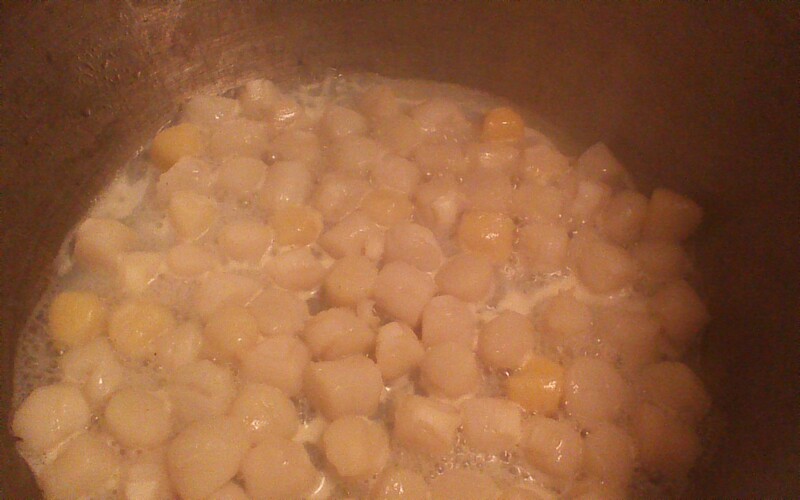 Step 3) If using bay scallops, sauté them in a saucepan for 3 – 5 minutes until they are a milky white color. Drain. 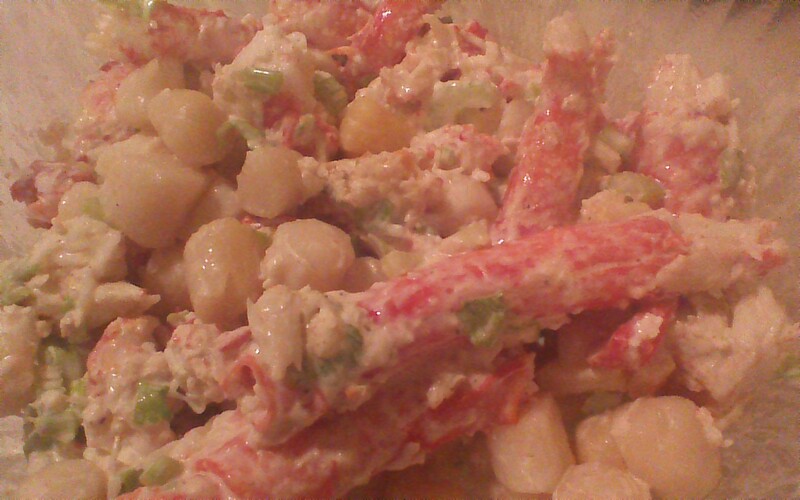 Step 4) Gently combine crab meat, scallops, mayonnaise, celery, and remaining 1/2 teaspoon seafood seasoning blend. Try not to break up the crab meat. Refrigerate. 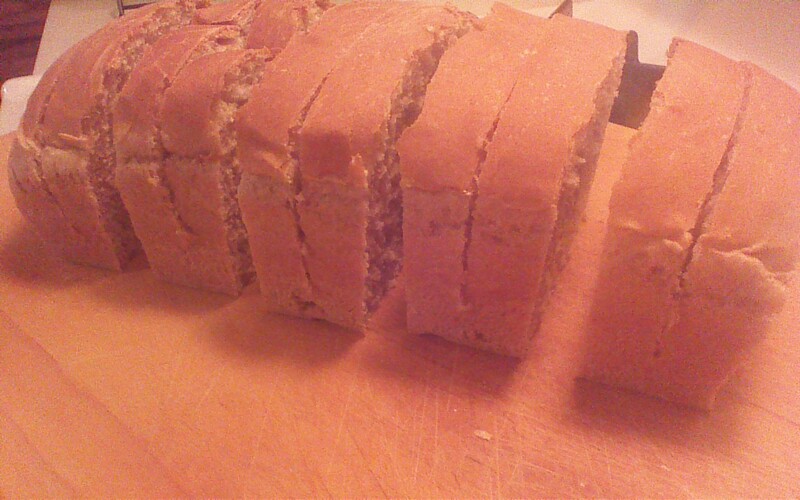 Step 5) Cut four generous, 2 inch thick slices from your loaf of Simple Bread. Then, cut through the middle of each slice from the top, stopping 1 inch from the bottom crust. Your slices should open in narrow “V” shapes, as shown above. Step 6) Place 1/4 cup of butter on a baking pan with low sides, and melt by placing in a 350 degree oven for a few minutes. Watch carefully, and remove pan when butter is just melted! Step 7) Place each of your four “V” shaped bread rolls down on the melted butter, then flip over so that each of the two outsides are buttered. Return pan to oven to toast your bread rolls for five minutes. 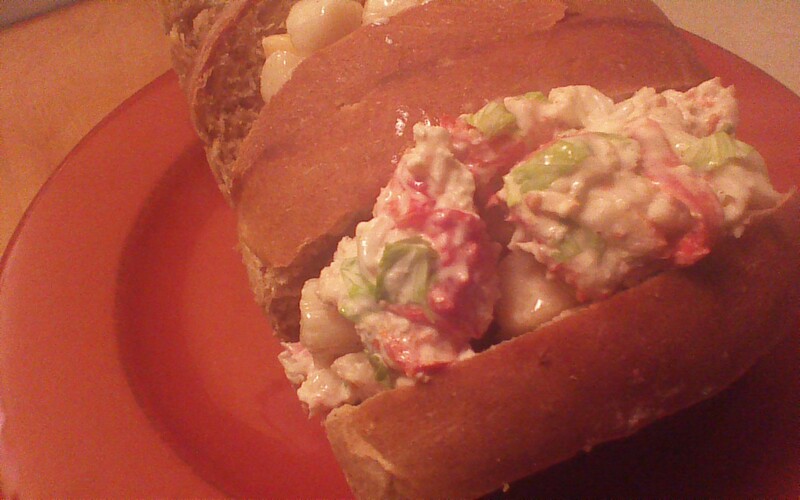 Step 8) Remove your toasted bread rolls, and carefully fill with equal quantities of your seafood mixture. Serve right away, while the rolls are warm and the seafood is cold. Chinese New Year falls on Monday, February 8th this year. 2016 is the year of the Red Fire Monkey. You fall under the sign of the monkey if you were born in 1920, 1932, 1944, 1956, 1968, 1980, 1992, 2004, or 2016. Chinese astrology suggests that people born under the sign of the monkey should expect competition and challenge in 2016. Chinese New Year celebrations often span one week or longer, involving spectacular parties, fireworks, family reunions, and lots and lots of food! Today’s recipe for Poached Tuna with Noodles is just the dish to get you in the spirit of things, while still being kind to your body. Poached Tuna with Noodles is a heart-healthy dish complete with long vermicelli noodles for good luck! 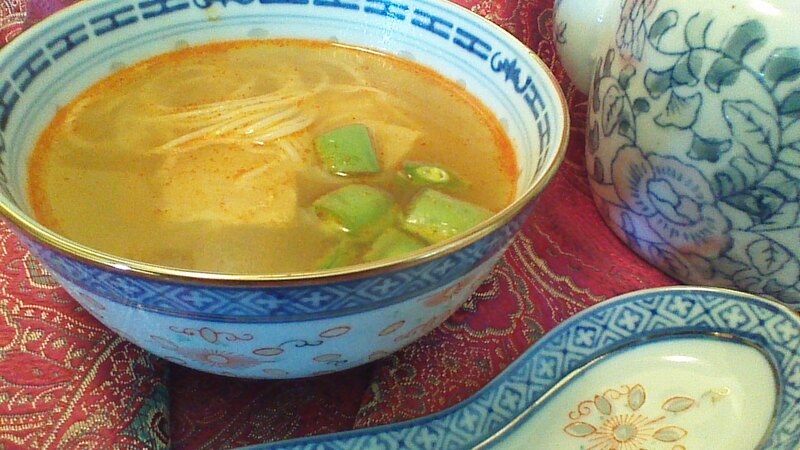 Noodles represent longevity, and according to superstition should never be cut. 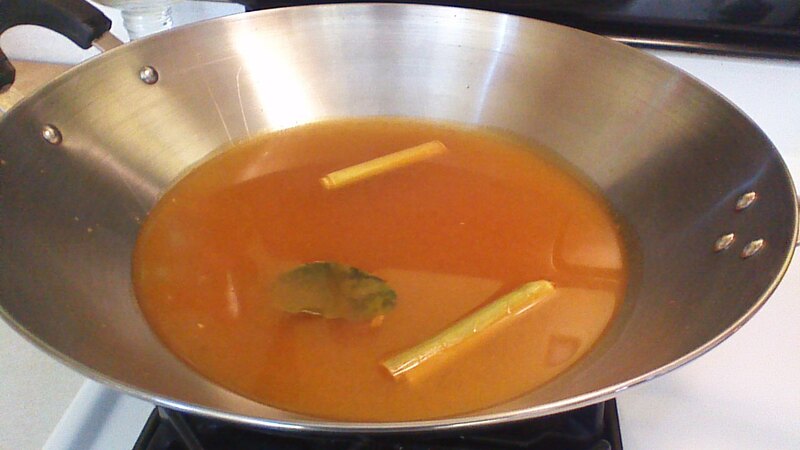 Step 1) Combine lemongrass, lime leaf, tom yum paste, ginger, and water in a wok or large pot. Bring to a boil. Step 2) Add broken shiitake mushrooms and vermicelli noodles. Reduce heat and simmer for 3 minutes. 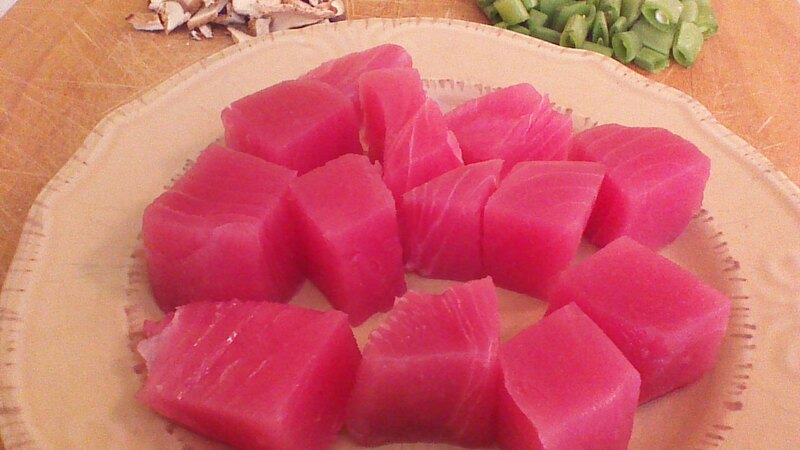 Step 3) Add tuna pieces and simmer for 5 minutes or until tuna is just barely pink in the center. Step 4) Remove wok from heat. Stir in sliced snow pea pods. Serve immediately. This recipe begins with precooked seafood, and is surprisingly quick and easy to prepare. Grab a few ingredients on your lunch break, and you can have a fancy dinner tonight in less than 30 minutes! 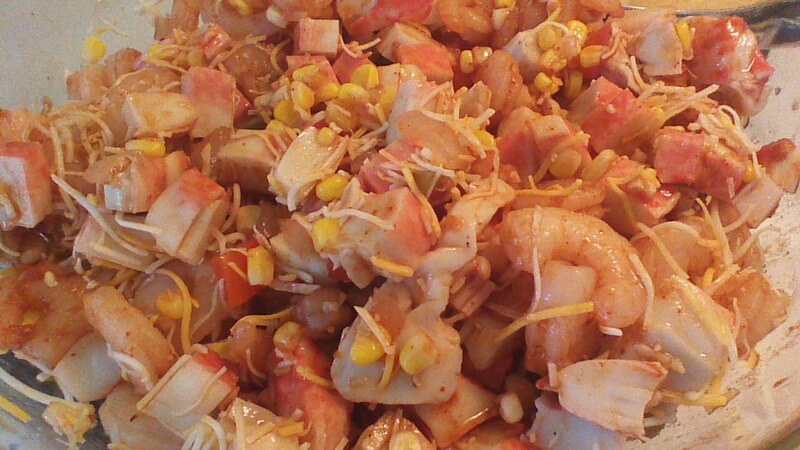 Step 1) Combine cooked shrimp, fish, scallops, corn, bell pepper, and onion in a large mixing bowl. 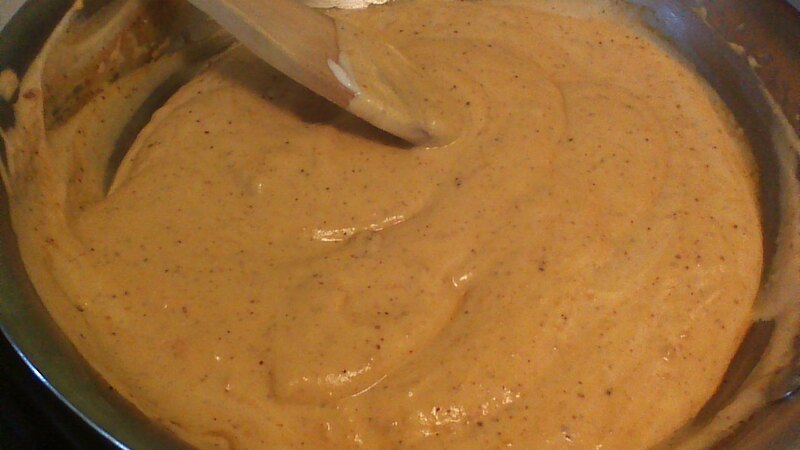 Add 1 cup of enchilada sauce and 1 cup of Monterey Jack cheese. Mix well. This is your seafood enchilada filling. Step 2) Melt butter in a medium saucepan. Add flour and chili powder. 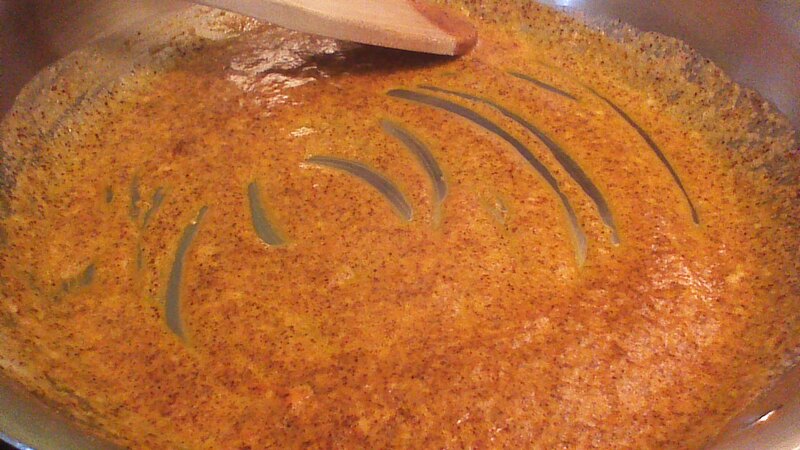 Stir constantly over medium heat for three minutes, to form a roux-style base for your top sauce. Reduce heat to low; whisk in milk and salt. 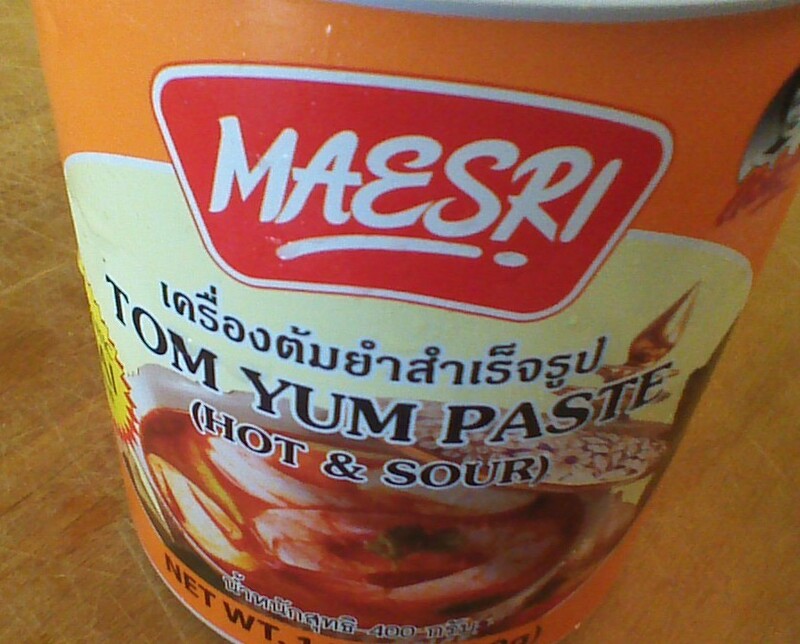 Stir in sour cream. Remove from heat. This is your top sauce. Step 3) Add approximately 1/2 cup of seafood enchilada filling to the center of each tortilla. Fold tortilla in thirds, keeping the filling in the center, and place enchiladas folded sides down on a baking sheet. Step 4) Using a pastry brush, lightly coat the tops of your seafood enchiladas with the remaining red enchilada sauce. Place a heaping teaspoon of top sauce on top of each enchilada. Spread top sauce over the length of each enchilada using the back of a spoon. Finally, sprinkle the remaining cup (or more) of Monterey Jack cheese over the tops of your enchiladas. Step 5) Bake enchiladas in a preheated 375 degree oven for 10 – 15 minutes, or until the cheese on top of the enchiladas is melted and bubbly. 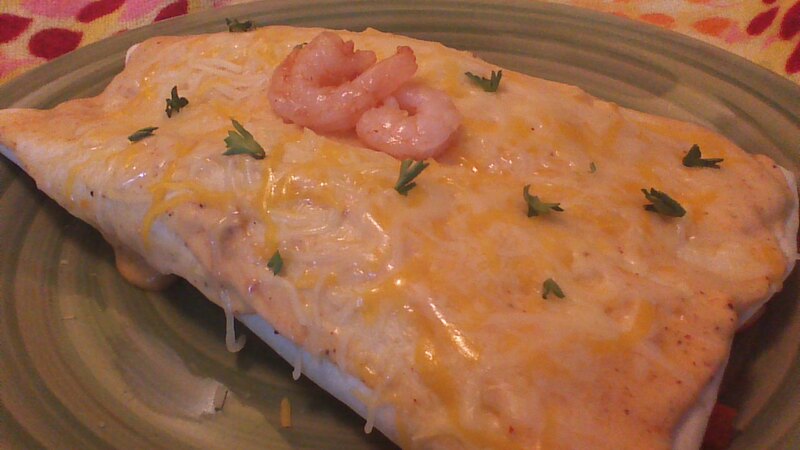 Enjoy your seafood enchiladas!